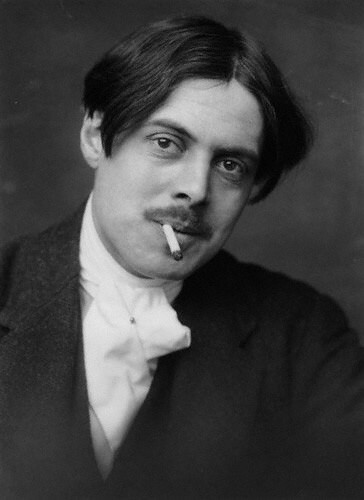 Percy Wyndham Lewis (1882-1957) was an artist and a writer of strange fantasy novels; during the Great War he was a war artist. He wrote at the start of his Blasting and Bombardiering (3). I will go over my credentials. I am an artist—if that is a credential. I am a novelist, painter, sculptor, philosopher, draughtsman, critic, politician, journalist, essayist, pamphleteer, all rolled into one, like one of those portmanteau-men of the Italian Renaissance. I am a portmanteau-man (like “portmanteau-word”). I have been a soldier, a yachtsman, a baby, a massier, a hospital patient, a traveller, a total abstainer, a lecturer, an alcoholic, an editor, and a lot more. Lewis was born in a yacht called Wanda, off Nova Scotia (which, pace Clute, does not make him Canadian or Canadian-born), of an American father (who had fought in the Civil War) and a British mother. That was the family story, at least, but in fact he was a year old when Wanda was constructed, and five before his father owned it, and he was probably born on shore; of rather more interest, as O’Keeffe notes, he was born during a spectacular display of the Northern Lights, which were seen across the North American continent as far south as Chicago. His parents separated in 1893, and his mother brought him to England. He ended up at Rugby School, and from there went to study at the Slade School of Fine Art in London, from 1898-1901. He spent some years in Paris; he published some short stories, and began a novel. He began to find his painting style—a blend of cubism, futurism and expressionism—was dubbed Vorticism in an article that was published in Blast (which he himself edited) in July 1914. He produced a vorticist room for the Restaurant de la Tour Eiffel in Percy Street, London, in 1915, and organised London’s only vorticist exhibition in June 1915. In 1916 he joined the army as a gunner. Lewis was also writing seriously again in the 1920s. He planned a “megalo-mastodonic masterwork” called The Man of the World. He eventually published it in several parts In 1926, Time and Western Man appeared, in 1928 The Childermass, and The Apes of God. In the following year he published what Richard Cork called “a disastrously admiring book called Hitler“; even though he repudiated it with The Hitler Cult in 1939, he had made many enemies. Just before war broke out in 1939 he and his wife left England, moving from New York to Toronto, and then to Windsor in Ontario. He returned to London in 1945, and became the art critic of The Listener, which lasted until he was hit by blindness in 1951. He continued writing, however, and the BBC broadcast his novel The Childermass in 1951 commissioning as both plays and novels two sequels, Monstre Gai and Malign Fiesta. Together these form The Human Age. Just before his death, the Tate organised a retrospective exhibition called “Wyndham Lewis and Vorticism”. The Human Age is his most significant and original contribution to fantasy literature. Clute comments (see link in first line) that the “arduousness” of the first volume probably keeps some readers from the more accessible later sections, and deplores that Lewis’s fiction remains less read than read about. The Human Age depicts the coming of Pullman and Sattersthwaite into an afterlife; the Bailiff decides whether or not they should go into the Magnetic City, which at first seems to be Heaven. Once there, in Monstre Gai, they reach a Third City, which is like a dystopian UK; and in Malign Fiesta they make an extraterrestrial journey to Matapolis—a hell, ruled by the demon Sammael. See Richard Cork, in the Oxford Dictionary of National Biography 33 (2004). Lewis’ art has been studied by many: see, e.g. 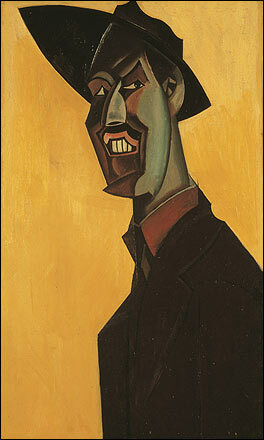 Richard Humphreys, Wyndham Lewis (London: Tate, 2004). On the Tyros project, see David Peters Corbett, in Corbett, ed., Wyndham Lewis and the Art of Modern War (Cambridge: CUP, 1998), 99-123; in this volume see also Tom Norman, on Lewis as “the anti-war war artist”, 38-57. For much more biographical detail, see Paul O’Keeffe, Some Sort of Genius: A Life of Wyndham Lewis (London: Jonathan Cape, 2000). A less reliable biography is Jeffrey Meyers, The Enemy: A Biography of Wyndham Lewis (London: Routledge & Kegan Paul, 1980). Wyndham Lewis’s own autobiography is arguably even less reliable, but it is certainly entertaining: Blasting and Bombardiering (London: Eyre and Spottiswoode, 1937; 2nd edition, Calder and Boyars, 1967, whose page numbers I cite), which I shall abbreviate as BB.